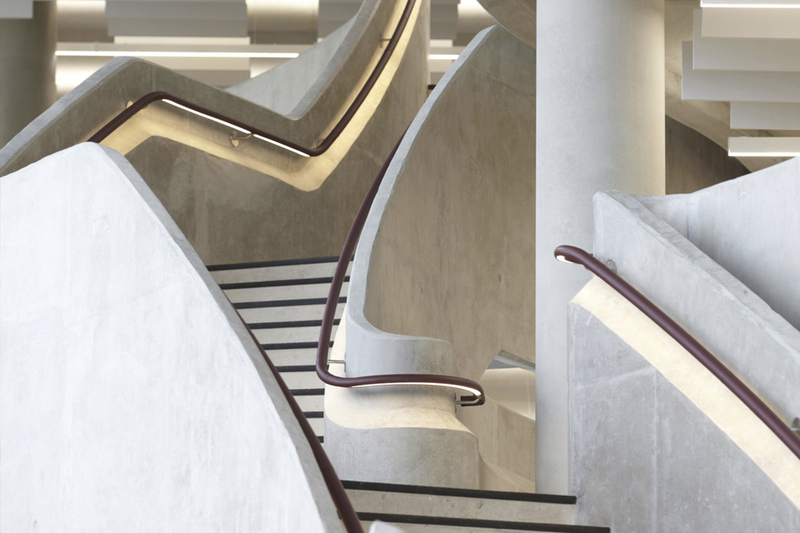 It takes a degree of confidence to specify an asstruck concrete interior to a prestige commercial project like the new £15m headquarters of insurer Hiscox in York. Nor are we talking here about super-smooth self-compacting mixes, or concrete born of specialist steel or fibreglass forms. This is standard, structural concrete poured into timber forms to create an architecturally stunning result. It is unexpected too. 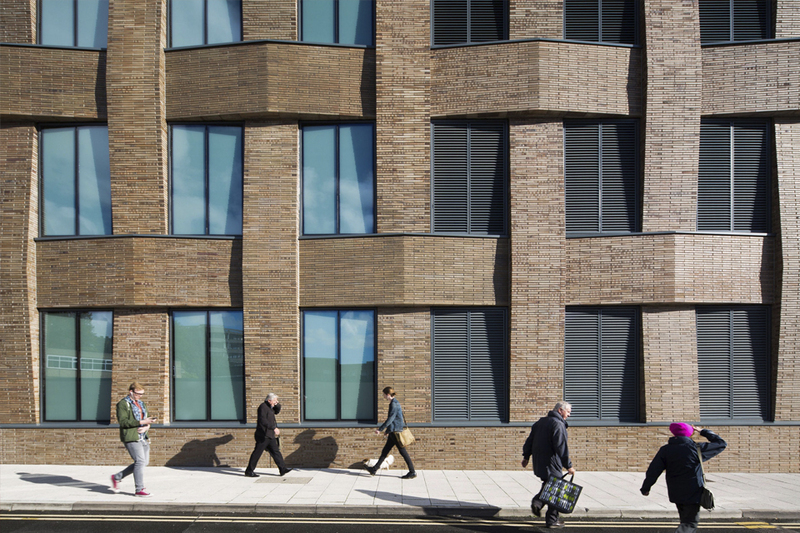 Approaching the 6,300m2 building, close to York’s historic centre, the initial impressions are of glass, steel and brick. It is only once through the doors that it becomes obvious that this is a building that has been poured into existence from bottom to top. The floor is poured resin, the columns and soffits are exposed in-situ concrete, as are the slabs and balconies, visible from the triple-height entrance atrium. 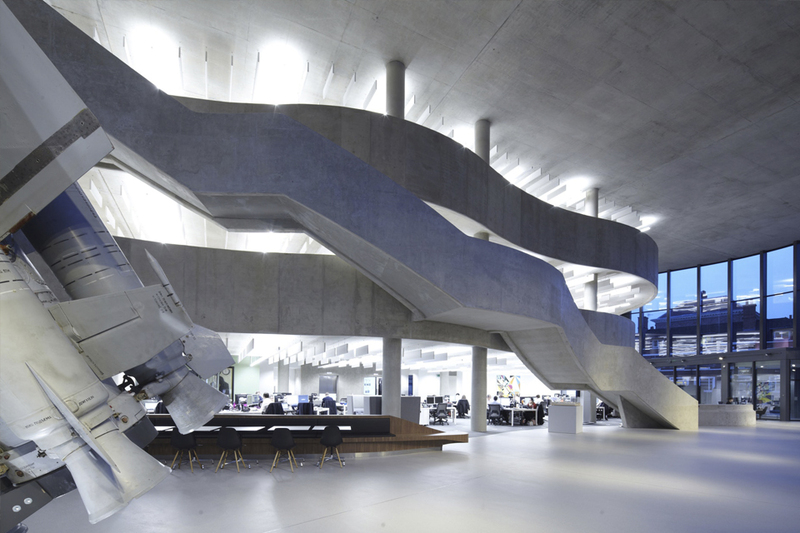 In addition, three spectacular concrete staircases wind their way through the atrium. Even the reception desk is a stylish sweep of the same in-situ concrete. The real structural gymnastics are in the stair landings. These are supported by 550mm concrete upstand beams that cantilever out from the slabs, hidden in the void beneath the raised floor. The void also supports the building’s displacement ventilation system and this works in tandem with the considerable exposed thermal mass to minimise heating and cooling requirements. The use of the concrete as thermal mass is a major part of the building’s environmental strategy and has helped it to achieve a BREEAM rating of Very Good. Parker adds that the concrete contained 40% ground granulated blast-furnace slag (GGBS) as a cement replacement both to lower the building’s carbon footprint and to help create the required pale finish. 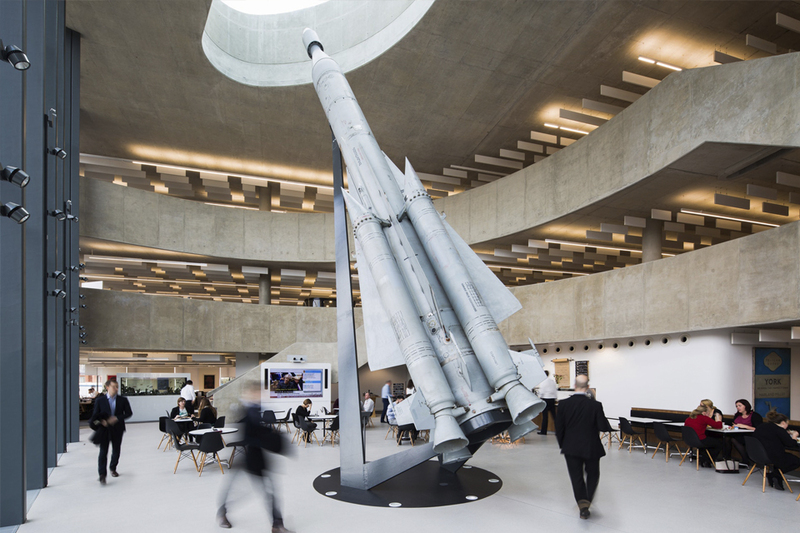 Dotted throughout the building are a number of large-scale artworks, most notably a decommissioned Soviet missile which seems poised to launch through the atrium skylight. In this context it is a handsome, sculptural object – at once elegantly inspiring and also an impressive grey chunk of heavy technology. It is testimony to Make’s vision that it seems to fit perfectly into the beautifully moulded environment around it. The words and images of this case study are taken from Concrete Quarterly, summer 2016 and that the images are from © Make Architects.